To access the software’s global settings select File - Settings from the main menu. 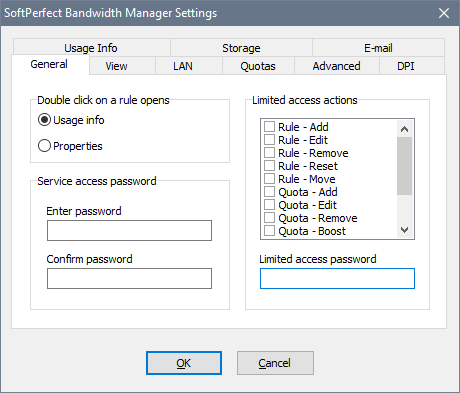 At the General tab you can set a logon password that will protect the Bandwidth Control Service from unauthorised access. You can also set up a limited access password to allow access to certain actions only. 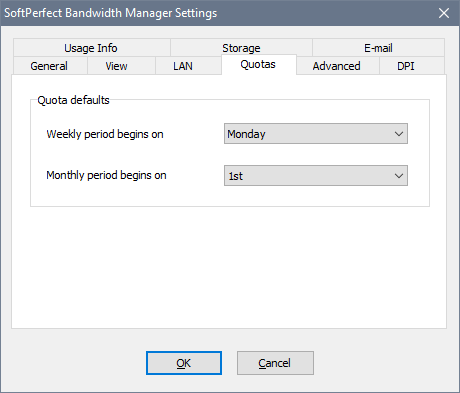 Max queue size is the capacity of a rule’s queue, which holds network packets when they exceed the bandwidth limit. 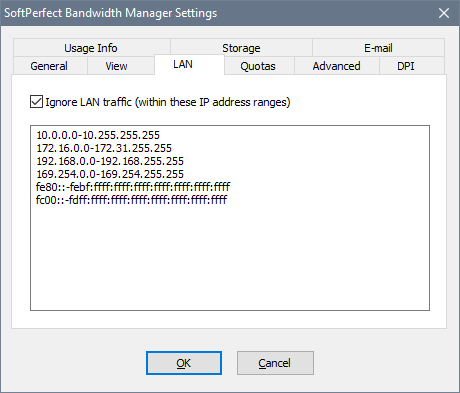 Transmit TCP ACK without queuing instructs the bandwidth manager to forward the TCP Acknowledge packets without any delay. This affects only the short TCPv4 packets sized 54 to 74 bytes and TCPv6 packets sized 74 to 94 bytes with the ACK flag set. 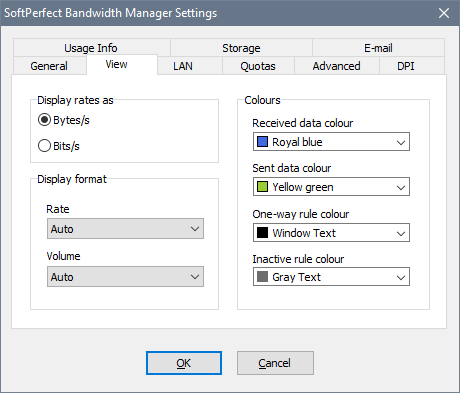 This option can be useful for bidirectional rules to achieve simultaneous uploads and downloads close to the specified rate. 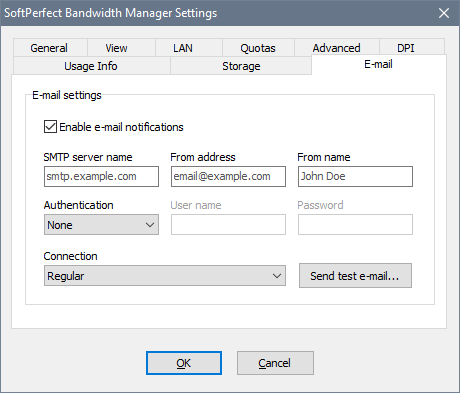 Short packet flood penalty allows to pad too small network packets to prevent users who use software applications that send a lot of small packets from overfilling the network. This may be useful for wireless networks. There are two parameters, Threshold and Padding. Both must be in the range 1 to 1500. If either of them is zero, no user will be penalised. Otherwise, if the packet size is less than the threshold, it will be padded with the padding bytes and hence the user’s bandwidth will decrease. The DPI (Deep Packet Inspection) tab determines which protocols in these categories are detected. Generally there is no need to turn any of these off unless you are getting false detections. In order to make a rule match one or more of these categories, open the rule properties and go to Advanced - Even more advanced settings. 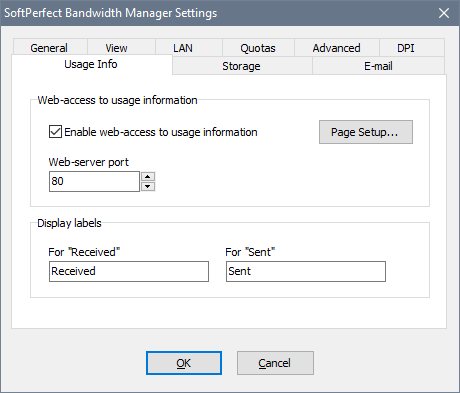 The Storage tab displays the bandwidth manager’s database location and size. It also allows you to set for how long the usage records should be kept. 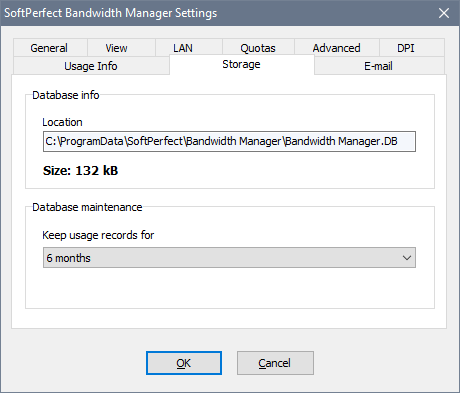 You may want to reduce this period to optimise performance and have a smaller database. The database is a standard SQLite 3 database and it can be opened in any SQLite management tool provided it is recent and supports SQLite databases created in the WAL mode.